It appears there is one man in the National Football League who owns the secret to beating Tampa Bay’s nearly unbeatable defense. That would be New Orleans Saints QB Aaron Brooks, who is largely responsible for two of the Buccaneers’ three losses this season. The second occurred Sunday night in the Superdome, as NFC South foe New Orleans completed a season sweep of the Buccaneers with a ragged, 23-20 victory. The Bucs, leading the NFL in turnover differential entering the weekend, had a difficult time holding onto the ball, fumbling four times and losing two of those loose balls. QB Brad Johnson was also intercepted for the first time in four games, and those three giveaways, plus a pair of long returns by Michael Lewis in the third quarter turned a 9-6 halftime lead deficit into a 20-9 lead for the Saints, which they never relinquished. Brooks got off to a slow start, completing just one pass for two yards in the first quarter, but he heated up in the second and third periods, engineering one first-half touchdown drive and throwing two scoring passes in the third quarter. By the end of the game, he had a strange mix of numbers, completing just nine of 25 passes for 155 yards but throwing two touchdowns and no picks. Added to his two-touchdown day in a season-opening, 26-20, overtime Saints win in Tampa, Brooks has four TD passes against Tampa Bay this season; the rest of the league has three in 10 games. Brooks also sustained a bruised right bicep in the fourth quarter and sat out New Orleans’ last drive. It was left to backup passer Jake Delhomme to complete a final third-and-eight pass that allowed the Saints to run the last two minutes off the clock. There was, in fact, a string of big-gain plays in the game, but the game turned more on the big breaks. How fervently both teams wanted that game-turning break in the pivotal third quarter was represented at the 12:46 mark in the third quarter, when each squad’s offense was on the field while awaiting a replay ruling. The issue was an Aaron Stecker fumble on a kickoff return and the eventual news wasn’t good for the Buccaneers. Tampa Bay lost the challenge and had to bring their defense back on the field. Of course, that’s often a good thing for the Buccaneers, and this time Tampa Bay made its own break. LB Alshermond Singleton’s blitz resulted in a sack and a forced fumble, recovered by DE Greg Spires at the Bucs’ 34. In effect, the strange turn of events cost Tampa Bay seven seconds before their first second-half drive could bet underway. However, the wild swings of emotion continued moments later, however, when Lewis took a Tom Tupa punt 56 yards down to the Bucs’ 20. Three plays later, on third-and-four, Brooks pump-faked to WR Joe Horn, who then turned up into the end zone and was wide open for the 14-yard touchdown pass, giving the Saints their 11-point cushion. And, more often than not, Brooks’ big plays occurred on third down, as the Saints converted on nine of 17 third-down tries against the league’s number-one third-down defense. For instance, New Orleans took the lead for good in the third quarter on a third-down Brooks creation. Following a 41-yard Lewis kickoff return, the Saints faced third-and-goal from the three. Brooks somehow slid a pass in between S Dexter Jackson and CB Ronde Barber to WR Jake Reed. The whole group went down in a pile but Reed held up the ball and the official signaled touchdown. Meanwhile, Tampa Bay’s offense succeeded on just two of 14 third downs. The Bucs did make good on three-of-three fourth down tries, all during an impressive, 84-yard touchdown drive in the fourth quarter that pulled Tampa Bay within three points with just under three minutes to play. Johnson was eight for 13 for 73 yards on the drive, throwing critical fourth-down completions to Joe Jurevicius, Keyshawn Johnson and Keenan McCardell. The last of those was a two-yard touchdown pass on fourth-and-goal, after which the two Johnsons hooked up for a two-point completion. The Saints ended up winning by the margin of a field goal, courtesy of John Carney’s 48-yard shot after Johnson’s fourth-quarter interception. 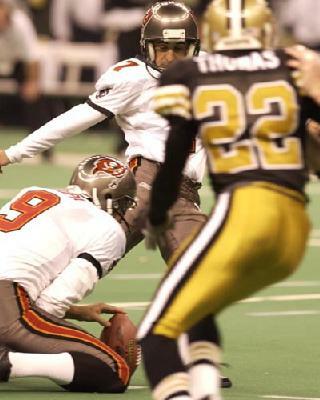 Martin Gramatica did have a 51-yard field goal in the third quarter, giving him five successes in six tries this season from beyond 50 yards. Brooks was harried constantly in the early going, completing just one pass, for two yards, in the first quarter. However, the Saints passer rebounded nicely on New Orleans’ first drive of the second quarter, marching his team 80 yards on 10 plays for the go-ahead touchdown. Brooks was three-for-three for 48 yards on the drive, including a 28-yard completion to WR Joe Horn on an underthrown flea-flicker. RB Deuce McAllister finished the drive with a six-yard touchdown run, slipping out of a Derrick Brooks tackle. 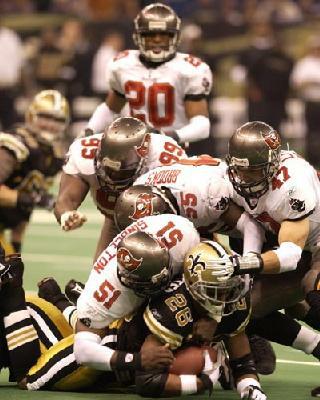 The Saints curiously went for two after the score, and were denied when Sapp stopped a McAllister run up the middle. Though the two teams had combined for just 51 yards of offense in the first quarter (48 by the Buccaneers), Tampa Bay immediately answered the Saints’ 80-yarder with a 90-yard march of their own, the team’s longest scoring drive of the year. At first, it appeared as if the Bucs would go nowhere on the drive. However, on third-and-four, Brad Johnson made something out of nothing, throwing a touch pass to WR Keenan McCardell for 26 yards as DE Willie Whitehead was burying the quarterback. On the very next snap, Johnson tossed a short pass over the middle to FB Mike Alstott and Alstott outran S Sammy Knight to the right corner of the end zone for a 44-yard touchdown. The Bucs thus led 9-6 at halftime, though they missed out on a golden opportunity to extend the lead. FB Jameel Cook’s 13-yard catch gave Tampa Bay a first down at the Saints’ 17 late in the second quarter. However, a sack, a false start and two Saints blitzes not only kept the Bucs out of the end zone but added critical yards to the ensuing field goal attempt. Martin Gramatica’s 42-yard attempt was denied by the right upright. A Buccaneer safety was the only score of the first quarter, a result of DE Simeon Rice’s third sack of the first period. Rice swatted the ball out of Brooks’ hand and it bounded out of the back of the end zone before a pursuing Warren Sapp could get it for a touchdown. Even after the loss, the Bucs remained tied for the best record in football, as their 9-3 mark equals the win-loss marks of Green Bay and Philadelphia. However, their lead in the NFC South division shrunk to one-half game over the Atlanta Falcons, who beat Minnesota in overtime earlier in the afternoon, and one game over the Saints. Overall, it was a tough day for the Bucs, who got a rare opportunity to watch an afternoon of NFL football unfold. All of the team’s closest pursuers in the NFC – Green Bay (9-3), Philadelphia (9-3), Atlanta (8-3-1), San Francisco (8-4) and, of course, New Orleans (8-4) – won their outings and picked up a game on Tampa Bay. The Bucs play Atlanta next Sunday with first place in the NFC South on the line.